I believe your ideas matter. That’s why I’ve spent the past decade helping writers just like you—from total beginners to bestselling authors—get their words on paper. If you’ve been working on something and spinning your wheels, it might be because you’re making one of these common mistakes. I can show you five simple steps to spark creativity and get back to writing something worth sharing. Guided group support to help you go from idea to outline, in 90 days, online. Guided individual support to help you go from idea to outline in a single day. Full-service support to take you from idea to book on your terms and your timeline. 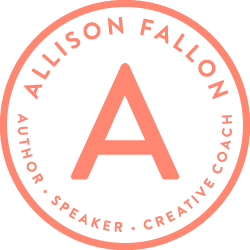 Hi, my name is Allison—bestselling author and founder of Find Your Voice, a community I built to support anyone who wants to write anything. When I first entered the publishing world 10 years ago, I had no idea what I was doing. All I had was a deep sense I had something to say and the audacity to believe, someday, someone would listen. Since then I’ve written 12 books (and counting), coached thousands of authors to outline, draft, edit and publish their work and I’ve learned a thing or two about the world of writing and publishing. And still I can remember vividly those early days—how passionate and committed I was. How insecure and frustrated and stuck, with no one to help me find my way. This is why I’ve committed the past decade of my life to helping authors just like you get their words on paper. If you have a book idea, I believe it’s because you’ve been commissioned to write that book. No one else on the planet can do it. Only you. I know from experience you’ll question whether you have what it takes, get stuck along the way, lose motivation, lack inspiration and more than likely (according to research) give up. I find that to be tragic and unfair. Which is why I’d be honored if you’d let me help you. I’ve worked with writers of all kinds—from total beginners to bestselling authors—and I’ve learned one thing is true: no matter who you are, you’re wondering if you’re a “real” writer, worried this will be a waste of time, unsure if you’re idea is even a good one and unlikely to get there on your own. Yet there’s a story burning inside that might kill you if you don’t get it out. Let me help you get the right words down.